Some dads are pulling as much weight as their partners, as evidenced by the sheer number of them at the playground on any given afternoon (yes, especially Fridays). But most parenting magazines, message boards, and events columns skew toward moms. Working to remedy this imbalance is NYC Dads, a city Human Resources Administration outreach program that encourages men to stay connected to their children. On May 3, head to the New-York Historical Society, where NYC Dads will be hosting raffles and Revolutionary-era games and crafts (like drum and tricorn-hat making and invisible-ink writing) as well as a free lunch. “Better fathers help make better families, and better families are good for all New York,” says HRA commissioner Robert Doar. “That’s why we believe it’s important to celebrate the role of fathers in children’s lives as often as possible.” In a lovely moment of synergy, the Historical Society is mounting a fascinating exhibit on the French Founding Fathers, which dads and tots can explore together; they can also chat with historic reenactors (what’s up, George Washington?). 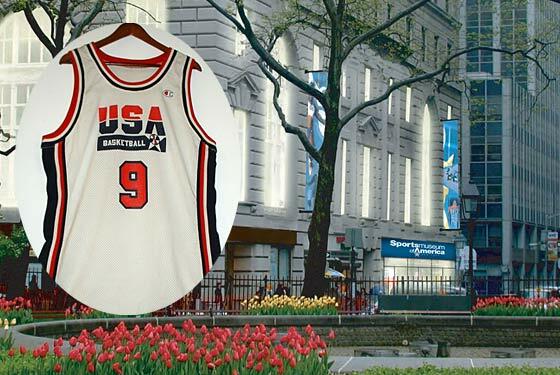 To follow up on the bonding, head downtown on May 7 for the opening day of the brand-new Sports Museum of America. It’s home to the Heisman Trophy and the first Women’s Sports Hall of Fame. It’s interactive, multimedia, and filled with just the sort of artifacts—Jimmie Johnson’s NASCAR championship car, Brandi Chastain’s legendary sports bra (! ), and the U.S. flag that goalie Jim Craig wore after the U.S. hockey team upset the Russians in the 1980 Olympics—most fathers will enjoy. Oops, that was horrid stereotyping. 5/3, 1 to 4 p.m. The New-York Historical Society, 170 Central Park W., nr. 77th St. (212-331-6200 or nyc.gov.html/hra); free, reservations appreciated. 5/7, noon to 7 p.m., last ticket sold at 5:30 p.m., Sports Museum of America, 26 Broadway, at Beaver St. (212-747-0900 or sportsmuseum.com); adults $27; children (4 to 14) $20; under 4 free.